The Canadian National Marathon Champion Cory Wallace claims his first Crocodile Trophy stage win today in Irvinebank after dominating the elite field together with the overall race leader Mark Frendo who came in second on the 80km stage. Third is the Czech rider Jiri Krivanek ahead of M1 racer Mario Färberböck (AUT) and Matthew Page from Great Britain. After three days of racing Liesbeth Hessens (BEL) seems in her element in the Australian Outback and with another stage win increases her lead in the overall female classification. 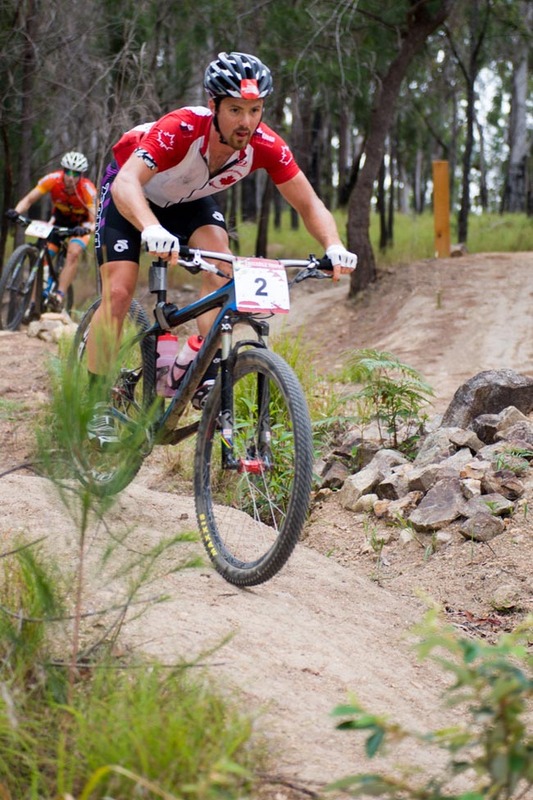 Day three of the Crocodile Trophy started on the new Atherton mountain bike trail network – more than 30km of singletrails, steep pinch climbs and flowy, technical descends had the racers’ adrenaline levels pumping until the first feedzone in the rainforest of Hasties Swamp National Park. What started as a drizzly day soon turned into a steaming hot day as the riders made their way towards the Great Dividing Range on wide fire trails and the lead duo of Cory Wallace (CAN) and the overall race leader Mark Frendo was unreachable for chasers Krenn (AUT), Krivanek (CZE), Färberböck (AUT) and Matthew Page (GBR). While the stage win was decided in a finish sprint in Irvinebank the Belgian rider Sander Cordeel unfortunately crashed badly on a steep descend and had to be transported to Cairns with a suspected shoulder injury. Team mate and supporter Maarten Neyens confirmed that the brave Cordeel was diagnosed with some ligament damage at the Cairns District Hospital this afternoon and that he suffered no fractures or any further serious injury. He was in good spirits and will actually continue to travel with the Crocodile Trophy, joining his fellow riders again at Mount Mulligan in one of the support vehicles, “This is just too much fun, I don’t want to miss one day of it”, he had said. The Austrian Wolfgang Krenn meanwhile was forced to retire from the race as well with severe lower back pain and is most likely to accompany the race until Cooktown as well, pain management permitting. Liesbeth Hessens is one of the strongest riders, racing in the top Master field every day. “The Crocodile Trophy has been on my list of things to do – I don’t enjoy the standard kind of marathons or cross-country races, but I like the journey this stage race takes us on”, said the “real-life” nurse who lives and trains in Switzerland. “The mountains there were ideal to prepare me for the conditions here, I feel strong”, she the 30-year old rider from Belgium added. On tomorrow’s stage four the Crocodile Trophy riders will race for 118km/1600m to Mount Mulligan, expecting rough terrain at the start of the stage out of Irvinebank and then undulating country towards the large Outback cattle station, where camp will be set up near a lush billabong.